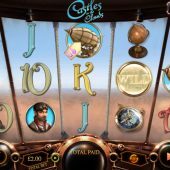 Castles In The Clouds slot is one of the few games I ever opened for the first time and was genuinely stunned by the quality, imagination and graphics. If this is the standard we can expect from UK developer Games Warehouse (GW Games), then us slot players are in for a treat! You are immediately immersed into a fantasy adventure world in which you are looking through the window of a pod under an airship at a spectacular landscape you are flying across. The game comes packed with classical music, tinged with dramatic overlays and rather contradictory to this the reels land with a futuristic zapping sound! The game may remind you of Netent's Steam Tower too. So, what can we expect in this world of adventure? The pilot, his lady, a compass and globe form the main symbols along with standard card icons. We have 20 pay lines and all symbols can appear stacked including the Wild. The Pilot pays 50x bet for 5-of-a-kind down to 1.5x stake for the lowest card symbol. Bonus icons appear on reels 1, 3 and 5 and these are important not only for the free games but after those games you will move on to the next world and add a gem in the meter on the top left of the game - once this is full and you have visited all the worlds, you get enhancements to the random Castles In The Sky bonus. The 3 worlds are Burning Desert (where you begin) Jungle and Ice Wastes. In each world you may get the Steam Respins a random feature where 1 to 4 reels will respin hopefully improving things for you. Each world has its own random Wild feature and unique Wilds appearing on all reels but all worlds have the standard Wild too. In each world the scatters appear on reels 1, 3 and 5 for the world's bonus. The random Wilds features do not trigger world changes, only the triggered bonus. Burning Desert - has a random Burning Wilds feature whereby you get 3, 4 or 5 free games where a random amount of symbols on the grid ignite and turn into Wilds. The Desert Bonus is a trail through the Canyon Of Cash where you spin a wheel and advance winning prizes. Get to the end and you will see the Big Money Bonus and pick a chest for a large final award. Ice Wastes - random trigger may occur for 3, 4 or 5 free spins with Icy Wilds which remain in place for the rest of the spins, basically a sticky Wilds feature. The bonus game is Compass Wilds - 5 free spins where after each a compass spins and wherever the needle points all symbols in that direction turn Wild. The Jungle - random trigger for Lightning Wilds can occur in which 3, 4 or 5 spins get lightning strikes on 1, 2 or 3 reels turning them Wild. The bonus trigger awards Sky Climber which is unlimited free games until a maximum altitude is reached. The altitude and its associated multiplier increases when the Altimeter icon lands on reel 3. The highest altitude has a 5x multiplier on all wins and you lose the Altimeter on reel and it is replaced by a 'Stop' symbol you hopefully won't see for a good while! In any world you may randomly trigger a Vortex Wheel. This may take you to the game's final and usually very rewarding bonus - The Castles In The Sky feature. On it will appear up to 3 gems if you have visited all 3 worlds by then. The more gems you have, the more free spins will occur. With all 3 you will get 5, 7 or 10. There will be a progress bar above your cockpit window and once 10 spins have been had reel 3 turns Wild. Now you may have seen that 10 spins is the maximum here but worry not - on reels 2, 3 and 4 you may land +1, +2 or +3 scatters. There is huge potential here as once spin 15 occurs, you will have all 3 centre reels Wild for the remainder of the spins, although they will have covered the extra spin scatters up so you will only have what's remaining over 14 that you already (hopefully!) accumulated.